I am a third great granddaughter of Joseph Ellis Dunagan and Lucinda Beall Dunagan. 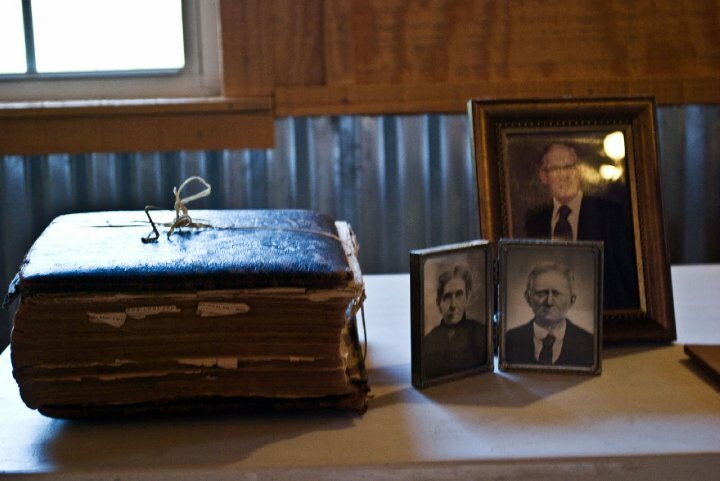 I was born and raised in Hall County Georgia where I grew up hearing the stories of my ancestors. One such story was of Joseph’s elusive buried gold. The following is an account of Joseph’s buried treasure in Hall County Georgia. Joseph Ellis Dunagan was a man of prominence during his time. He was the son of Ezekiel Dunagan who came here in 1798 with his brother Isaiah, leading in the second group of white settlers into the Indian Territory where present day east Hall County, Georgia is located. Ezekiel followed his father, Joseph and Joseph’s brother Joshua Dunagan (transcribed in some records as Joshua Darnigan) who led the first group to that area. They were all part of the original Wofford settlement. Joe grew up in a time when men had to work hard to sustain life and that he did with great success. He married the prominent Frederick Beall’s daughter, Lucinda, and bought land by the Chattahoochee River about three miles north of downtown Gainesville, Georgia. There is where he and Lucinda raised a family of eight. I think that Lucinda had to do much of the raising alone with her husband spending a considerable amount of his time traveling to the capital city of Milledgeville, where he served as the state senator representing Hall County, and this he did for 23 years. When not serving his county as a judge of the Inferior Court or as a state senator, he was traveling west. “Old Constitution”, as he was fondly nicknamed, found himself with the contagious ‘gold fever’. He would travel with his family members out west to pan for gold. These travels kept him away from home for long periods of time, and I know that at least once he was away from home for two years. The story begins when Joe decided to make a trip back to Pike’s Peak to retrieve some gold dust that he had left buried there. It was in the spring of 1861 when Joe packed up and left on his quest. His trip to Pike’s Peak was successful but the retrieval of his buried dust was not. It seems Joe was to return empty-handed. So Joe began his trip back to his family and home. He traveled as far as Illinois when he became ill. He was alone and he knew no one, but the times were friendlier then and he was given aid by strangers. They took him into their home and cared for him but Joe did not recover from his malady. He died there amongst strangers and was buried there also. Unfortunately, for us today, we do not know the whereabouts of his burial. Joseph Ellis Dunagan was known to be somewhat eccentric and with no banks available to him in Gainesville, buried his gold coins in the grounds of his land. The location of his buried treasure was unknown to anyone other than himself. Here begins the tale of the unearthing of the buried treasure of Joseph Ellis Dunagan. Now keep in mind that John said his father returned in March of 1860 and took the dust to Dahlonega for minting. Then Dunlap Jr. states in his own words that the gold coins, all minted in Dahlonega in 1860, were “bright and new, as if they had just come from the mint”. The gold minted in 1860, buried on Dunagan’s land, the Dunlap’s testifying that it was not their gold, and the well known fact that Joseph Dunagan, who owned the land prior to Dunlap, was a miner who had become quite wealthy from his endeavors, leads me to believe that the gold coins did indeed belong to the Dunagan estate. Now I find it interesting that Bales was more than willing to relinquish his son’s find to Dunlap, who claimed no rights to it, but refused to accept the logical explantion that the gold was indeed that lost buried treasure of Joe Dunagan. The Bales, thrilled with their found treasure, took the gold to Banks Brother’s Bank where it was counted and deposited to their credit. As you can imagine the news of the Jack’s discovery was spreading throughout the community and the talk was high. When John F. Dunagan and his brother Ezekiel, heirs and administrators to Joseph Dunagan’s estate, heard of the unearthing of the gold coins, they knew immediately that it was their father’s gold. John set out to tell Mr. Bales that the gold belonged to the Dunagan’s but Bales, of course, would not accept the Dunagan’s claim to their ‘gold fortune’. A suit was filed against Bales by the Dunagan’s in the Hall County Georgia Supreme Court. On March 29, 1887, Bales was duly served and required to give a bond of $2380.00 for the forthcoming property. The first trial thus proceeded and was declared a mistrial. Again, in November 1888, the case was called and the trial continued. This time the jury found in favor of the plaintiffs. This was not the outcome that Bales neither wanted nor expected, so a motion for a new trial was made. This motion was overruled so the case went to the Supreme Court on a writ of error for the October term. However, this never came to light because both parties were tired of the long drawn out court proceedings and decided to divide the money equally after attorney and court fees were paid. Now you would think this was the end of the story but it is not. I am not certain to the circumstances as to why the monies were not distributed amongst all the heirs of Joseph Dunagan but obviously they were not. The Dunagan’s found themselves in court again. A Petition and Citation for settlement was filled in Hall County Court by Martha Dunagan Highfield, Fred Dunagan, Mary Dunagan Short, and Elizabeth Dunagan Webster, surviving children of Joseph Dunagan and siblings of John F. Dunagan and Ezekiel Dunagan. A W.P. Smith is named also showing that he is interested as distributee in the Estate of Joseph E. Dunagan for which John and Ezekiel were legal administrators. DUNAGAN v. WEBSTER et al. Levy and claim. Before Judge Wellborn. Hall superior court. July term, 1893. S.C. Dunlap and W.L. Telford, for plaintiff in error. George K. Looper, contra. Joseph Dunagan died in 1861, and in the same year J.F. and Ezekiel Dunagan qualified as administrators of his estate. In 1887 certain money which had been buried by the deceased was found and went into the hands of the administrators. They were cited by the heirs to a settlement before the ordinary, and a judgment was rendered against them in favor of the heirs. An execution founded upon this judgment was levied on certain land as the property of Ezekiel Dunagan, and his wife interposed a claim to the property as having been set apart to her and her children as a homestead and exemption on March 29th, 1873. It appeared that he had never sold or otherwise disposed of the land. Upon the agreed facts the question whether the land was subject to the execution was submitted to the judge without a jury; and he found that it was, and to this ruling the claimant excepted. Where one qualifies as administrator, it is and undertaking equivalent to a contract on his part to duly administer the estate according to law for the benefit of heirs and creditors. In the present case the claim of the creditor was based upon this contract on the part of the administrator; and the contract, as we have seen, antedated the constitution of 1868, under which the homestead was set apart. The Supreme Court of the United States, in the case of Gunn v Barry, 15 Wall.610, reversing the decision of this court, held that the homestead right could not prevail against a contract created prior to the constitution-that as to such contracts the homestead is a nullity; and that ruling has since been followed in several decisions of this court. It has also been held that, as between the homestead right and the claim of a creditor founded upon such a contract, the date of the contract and not of the breach of it governs in determining the question of priority. Van Dyke v. Kilgo, 54 Ga. 551; Drinkwater v. Moreman 61 Ga. 395; Hunt v. Juhan, 63 Ga. 162; Douglass v. Boylston, 69 Ga. 186; Willis v. Thornton, 73 Ga. 128. It follows that the court below did not err in holding the property subject. Judgment affirmed. So it seems that the monies from the gold were never distributed amongst Joseph’s surviving children. The Dunagan’s share,prior to court and attorney fees, would have been $590.00 after the division with the Isaac Bales. The 1887 dollar value of $590.00 would be $14,390.24 today. The amount is calculated strictly on an inflation rate of the dollar value not the gold value. Since the money was in $5.00 gold pieces the value could be higher. As previously stated, in 1893 when the suit was filed, Joseph’s remaining children, excluding Ezekiel, were Martha, Mary, Elizabeth and Frederick. John died in 1890 leaving Ezekiel the only surviving administrator of the estate. This is why John is not mentioned in the above document. I am curious as to what happened to Ezekiel’s land and how it was distributed after the court finding. I am assuming it would have been sold and the profits divided. More research is needed to determine this. This is all that I have been able to ‘dig up’ on the gold of Old Joe Dunagan. I will keep digging in hopes of finding even more clues to the lost fortune of the Honorable Joseph Dunagan. As stated previously in “Following Joseph” Joseph Dunagan was given a Land Warrant for 200 acres of land in Franklin County Georgia. The order was given on February 6, 1792 and on January 1, 1793 he received the warrant. His brother Thomas received a warrant for 100 acres in Franklin County Georgia. The date on this warrant is written 23 January but the year is missing. We also find land warrants issued in Hall County Georgia to Benjamin Dunagan and Isaiah Dunagan. Benjamin was given 250 acres in East Hall County near the North Oconee River 3 May 1853. Isaiah’s warrant was dated 4 July 1854 but the acreage is unreadable. Ezekiel Dunagan is my fourth great-grandfather. 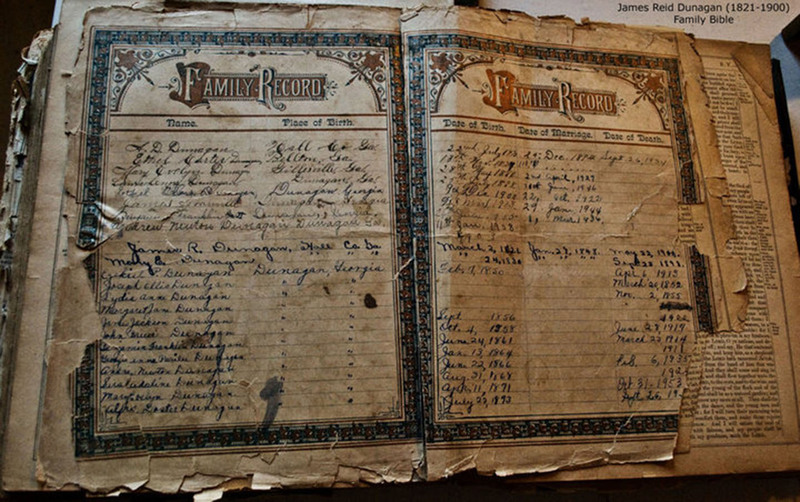 Ezekiel was born in 1770, according to family Bible records, in Pendleton, South Carolina. His father Joseph was given a land grant for 200 acres near the Curahee Mountain in Georgia and it is then that the first Dunagan’s came into Georgia. Later Joseph along with his brother Joshua Dunagan, incorrectly transcribed in some Hall County records as ‘Joshua Darnigan’, lead the first group of settlers into what is now known as east Hall County Georgia. They were followed by Ezekiel and his brother leading the second group of settlers to the Joshua Dunagan’s settlement. After Joshua’s death, it became known as the Joseph Dunagan settlement. It is in the same area that we find the grave of Ezekiel and Lydia. 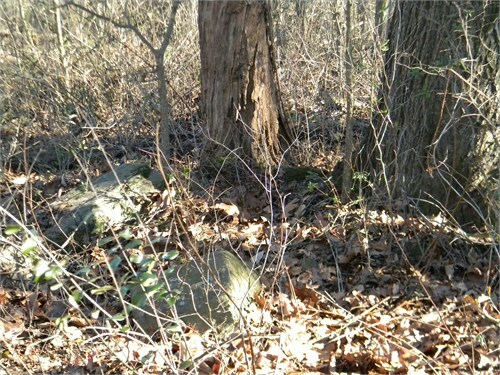 Through the years, nature had taken over the cemetery and many graves have been lost. 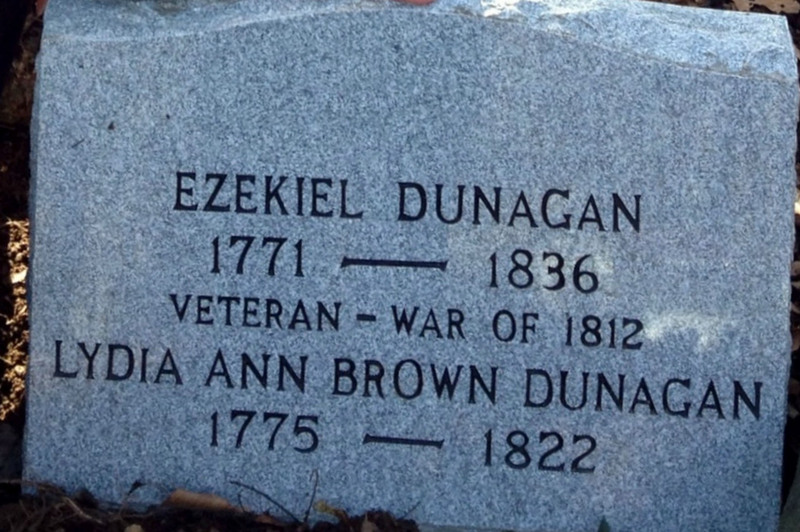 Thanks to those Dunagan’s who still live on the land that Ezekiel owned, we never lost the location of his grave site. It was a long time dream of mine to restore and mark the graves of my grandparents for present and future generations. Along with my cousins, we made this possible. The new tombstone was recently placed on the site. Thanks to each of you who contributed your time and money to make this possible.